For your own Christmas party we're happy to offer a range of menus, from a traditional Christmas dinner with all the trimmings, a mouth-watering seafood menu, or an informal seasonal canapé menu featuring the best the Cotswolds has to offer. 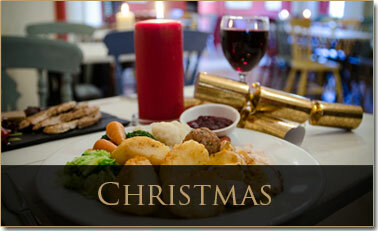 Or perhaps a Christmas breakfast tickles your fancy? The Stable Bar can accommodate up to 36 diners with flexible seating options, from banqueting to cafe-style for smaller parties, or up to 48 for buffet-style dining for informal social or corporate events. At The Golden Cross we're famous for our Christmas Day dining. No fuss, no hassle, just a great Christmas lunch for you and yours - and best of all - no washing up! Family parties, couples or individual diners are welcome to enjoy Christmas Day with us at the pub and in our Stable Bar function room. The Stable Bar is fully-equipped for entertainment, with in-house sound system, big-screen televisions and even a PS3 and Wii - great for the kids and (dare we say it) - Christmas Karaoke! No charge for room hire!